Desh Bhagat University organized an Industrial Visit for its MBA, BBA & B.Com – Pre Final year students at Kitty Industries, Ludhiana. The objective of this visit was to make the students familiar with the current trends in the competitive world by sharing knowledge, ideas and skills with those of the people from the industry. Students and teachers took a complete round of Kitty Industries along with Kitty official team members where students were given brief information about various departments like Grinding, Baking and Packing Departments of the Industry. The official team showed the Production & Packaging of Breads to the students so that students are able to get inputs about production and packing process of Breads. 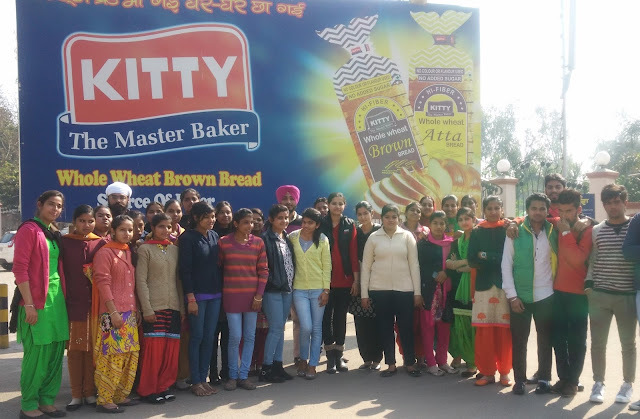 They briefed to the students that Kitty Industries is one of the largest manufacturers of bread and Bakery products in Punjab. The students while interacted with officials asked relevant questions to clear their doubts and Kitty Industries team answered the queries put forward by students which enriched the knowledge of students as well. University Chancellor Dr. Zora Singh and Pro Chancellor Tejinder Kaur appreciated the initiative taken jointly by Training and Placement department. They conveyed their best wishes to the students saying that they should get maximum industrial exposure to become time and market relevant. Vice-Chancellor Dr. Virinder Singh said that the university organises such educational and industrial visits frequently for the benefit of the students. All the students were quite happy to visit the Kitty Industries saying that it was a good experience for them. They thanked the university officials for arranging this knowledgeable visit.